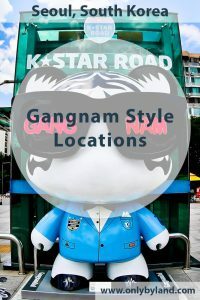 In addition to the famous filming locations, there are also several Gangnam Style inspired monuments. I was staying at the Instagram worthy Snow Hotel near Gangnam and I could easily access the metro to visit these sites. As part of the music video, Psy is dancing with a huge skyscraper in the background. This skyscraper is in fact the Seoul Trade Tower, one of the highest buildings in Seoul. To get to the tower you must take the metro to Samseong Station (219). 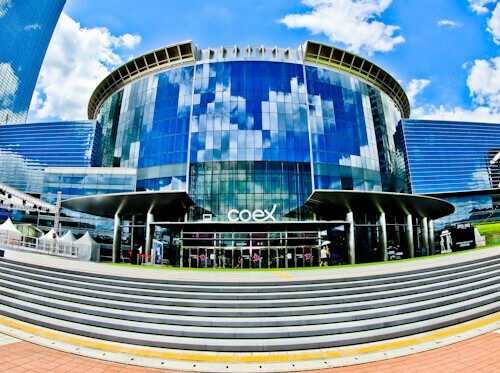 Coex Mall and conference center are located beneath the Seoul Trade Tower at Samseong Station (219). The nightclub scenes from the video were filmed in the COEX mall. Unfortunately due to refurbishment, you cannot see exactly where. 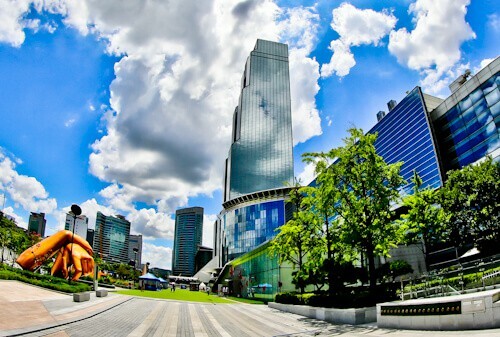 However, it is a huge shopping mall therefore a good place to do a little shopping and perhaps enjoy some Seoul food. Furthermore, there is one of the most Instagram worthy locations in Seoul located in the mall, Starfield Library. At the start of the Gangnam Style music video, Psy is performing the iconic dance in the middle of horse stables. This location is the Royal Saddle Equestrian Society. It’s a private club so I’m not sure what would happen if you dressed up as Psy ready to dance in the stables! Unfortunately, it’s located outside central Seoul and is not served by the Metro. One of the iconic scenes from the Gangnam Style video is when they perform the dance on a carousel. 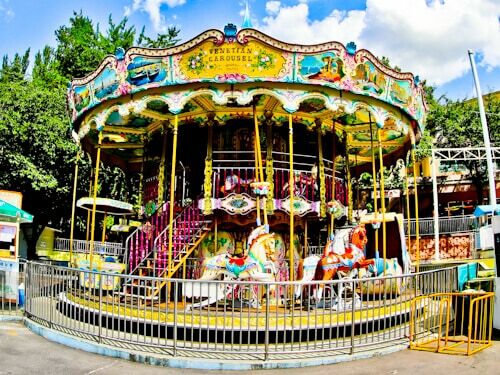 The carousel is located in Seoul Children’s Grand Park. 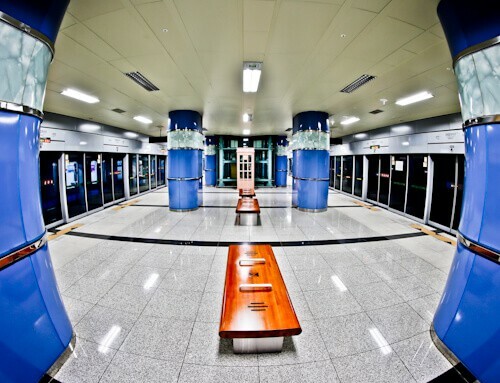 It’s located at the rear entrance so you’re best arriving at Achasan Metro Station (545). Good news for chicken lovers, there’s a Popeyes Chicken restaurant behind the carousel. At the beginning of the Gangnam Style music video there is a boy performing Michael Jackson moves in a playground. This boy was in fact found on Korea’s Got Talent. Psy was so impressed with his moves that he invited him to take part in the video. Little did they know the whole world would see it! The yoga scenes were filmed at Hangang Park on a bike track. If you decide to perform yoga here, be careful of passing bikes! During the video, Cheongdam Bridge is visible in the background. Other points of interest of Seoul visible from this viewpoint are the 1988 Olympic Stadium as well as the Lotte World Tower. In fact, the Lotte World Tower is the tallest building in Seoul. Additionally, if you’re looking for a place to swim in Seoul, there’s a huge swimming pool complex located in Hangang Park. 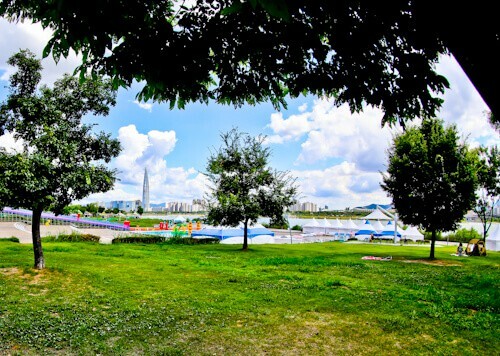 You can reach the park from Ttukseom Park Metro Station (728). 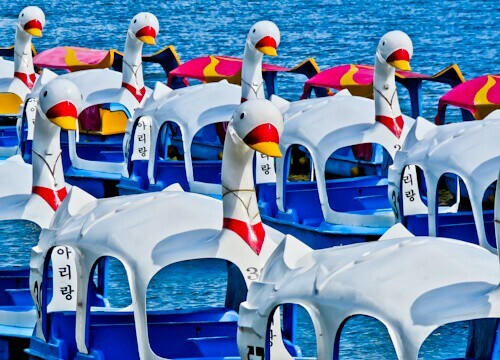 The swan boats are located at Hangang Park. In fact during the yoga scenes, you can see these boats in the background. Then Psy performs his dance on a speedboat with several of the swan boats in the background. These swan boats are available to hire! The last stop on Incheon Metro Line 1 is International Business District Station (I138). Psy performed his dance in this metro station. You may remember the dancers jumping off the wooden benches as part of the routine. It’s rumored they made the video early morning before commuters could enter the station. Westerners don’t know this but one of the dancers in the metro carriage is in fact a Korean pop star. Hyuna is a singer, dancer, songwriter and a model. 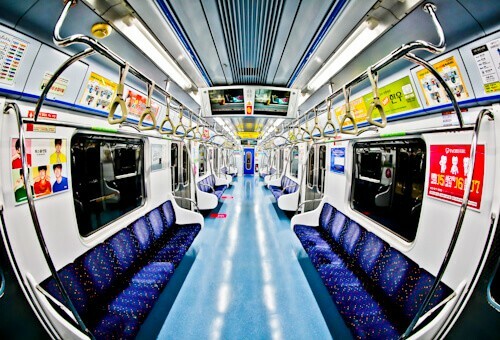 The metro they are dancing in is the train that runs on Incheon Metro Line 1. You can visit any station on this line and you’ll be in this train. However, you must take it to the last stop, International Business District, to see the metro station from the video. There are 2 famous Koreans in the parking lot and elevator scenes. Inside the elevator performing the thrusting dance is Korean comedian, Noh Hongchul. The dance off which occurs in the parking lot is a dual between Psy and another Korean comedian, Yoo Jae-suk. The elevator and parking lot are located close to the International Business District and Central Park metro stations. If you find them, let me know in the comments and send some pictures! 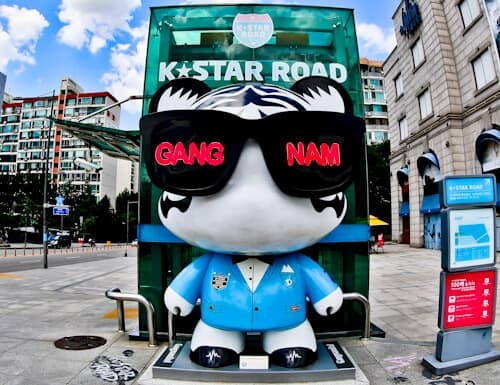 In front of the Seoul Trade Tower at Samseong Station is the Statue of Gangnam Style. 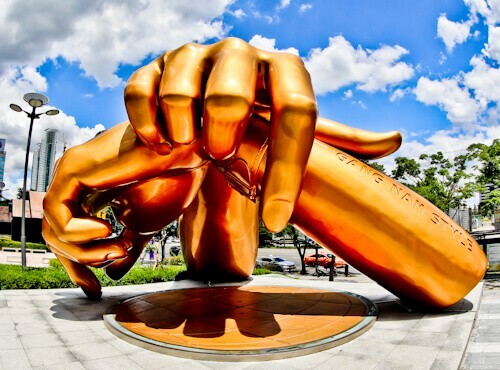 This is also known as the monument to Gangnam Style. There is an information board explaining the history of the song as well as some record breaking facts. Most importantly, when you stand under the hands, the music begins to play and you can perform the dance! 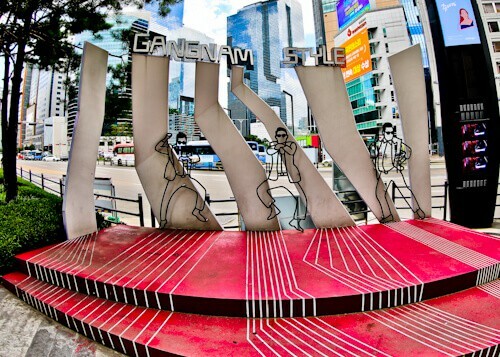 The Horse Dance Stage is located at Gangnam Metro Station. Of course, it’s this specific area which was the inspiration for the song. If you visit Gangnam Square in the evening, there is an hourly laser show. There are lots of shops in this part of Seoul too. In addition, there’s also a very useful, official tourist information office nearby. 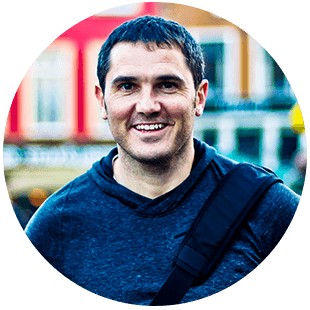 Any questions or plans you have in Seoul, you could ask about in here. 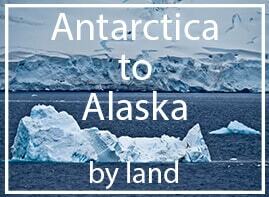 If not, it’s still a good place to pick up a map. Hallyu K Star Road celebrates South Korean culture. In fact, Hallyu means the Korean Wave of culture which has spread across the world since the 1990’s. Of course, there is a little Gangnam inspiration to this road! Even if you’re not familiar with South Korean culture, it’s certainly worth visiting. To reach the Instagram worthy K Star Road, take the metro to Apgujeong Rodeo Station (K212). Why is the Seoul World Cup Stadium a Gangnam Style location? Psy filled this stadium and performed the song to over 50,000 home fans. It was arguably the biggest event to take place in the stadium since the 2002 World Cup semi final between South Korea and Germany. Furthermore, it was at this Happening concert that he performed ‘Gentleman‘ live for the first time. Enjoy your visit to Seoul and I recommend you visit at least a couple of these famous filming locations. Here is the music video to refresh your memory! 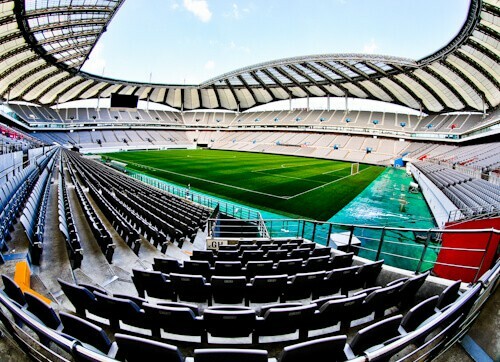 Take the Seoul World Cup Stadium tour. Visit the Instagram worthy Snow Hotel in Seoul.